To demonstrate the love, kindness and care that the District has for its students, the BBHCSD hosted a Love4BBH Community Rally at the varsity football stadium on Thursday, August 30, 2018 at 10 a.m. for students in grades 6 through 12, in advance of a similar rally which will take place at 6 p.m. for students in grades PreK through 5 and their parents. Approximately 2,200 students in grades 6-12 filled the home grandstand and were joined by Middle School and High School staff, as well as community members. The program began with staff and student members of H.U.D.D.L.E., a student-led group dedicated to drug and alcohol prevention, lining both sides of the stage while holding signs featuring lyrics to the song Give Love Away by singer-songwriter Noelle Maracle, which was played over the sound system. Members of the High School band and choir also delivered impressive performances to inspire and show support to the students in attendance. 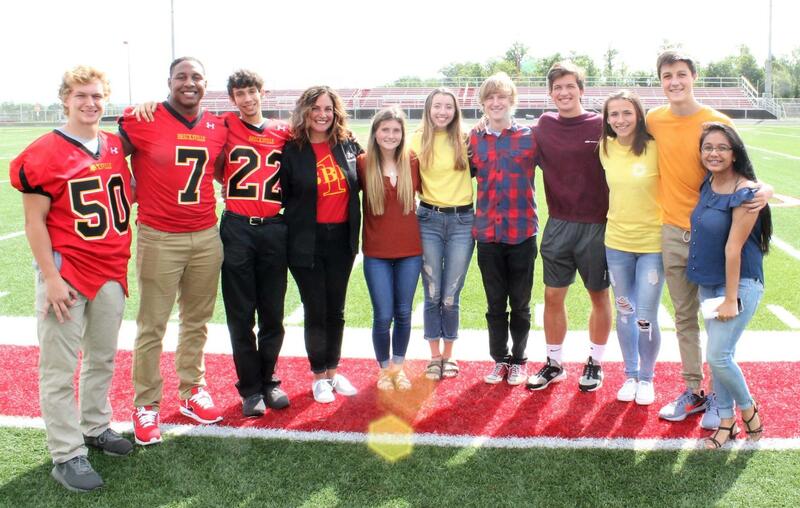 Superintendent Joelle Magyar introduced ten Brecksville-Broadview Heights High School students who delivered powerful, individual remarks on the importance of demonstrating kindness and reminding those present that they are not alone, but have the unwavering support of fellow students, teachers, staff and parents. Several students displayed a great sense of courage by openly sharing about their own struggles with mental health issues, and the importance of reaching out to others for help and support. The Love4BBH Rally for tonight will have a slightly modified program beginning at 6 p.m. and will include school organization booths, popsicles and other meaningful components. Please wear red or yellow to show your support. The BBHCSD believes that EVERY CHILD MATTERS and would like to thank everyone who participated in the Love4BBH Community Rally for communicating this all-important message to our students.